As we all know, it’s very challenging to recruit experienced IT professionals as the competition for the best talents is getting tougher and tougher every year. Just creating a job advertisement and posting it on various job portals is just not enough to lure the best candidates. However based on Stack overflows Developer Survey Results (2018), 59.8% of developers are open for new opportunities, even though they are not actively seeking them. 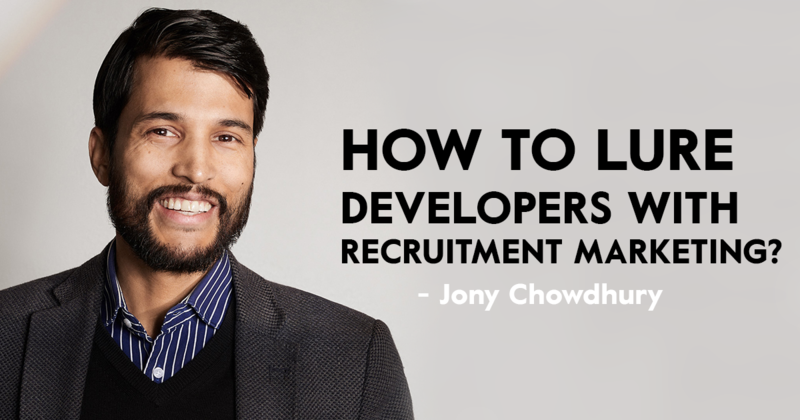 If we want to recruit developers, we need to think more like marketers. Therefore, I have listed ten tips that will help you succeed in recruitment marketing and get you closer to finding the talents you need. Let's start with a no-brainer. Before you can start planning any marketing campaigns, you should gather enough information about the selected target audience. For example, if you are looking for a new front-end developer to join the team, try to understand what is important to them, what channels do they use and why they typically change or search for a new job. Besides, don’t forget to ask help from developers you know. Have a cup of coffee with them and ask questions or test your ideas within this group. Choosing right channels is the most important thing you need to focus on. If you are not sure which channels your target group is currently using, then find it out. Remember that channels vary from social media to community sites like Reddit, Stack Overflow, Medium or even some specific website. The most important thing is that you are ‘on the same page’ as your target audience. Focus on quality and not on quantity. Remember that targeting is everything when doing recruitment marketing. Once the channels are chosen, it is time to modify your messages to fit the selected channels. Don't just reuse the same message and hope to attract candidates. If the message does not fit the channel, you will just get ignored. Think what your potential candidates are looking for in the channel. In some cases you can be more direct and just say that you are looking for developers. However, one good way to gain attention is to share stories about interesting projects that your team is currently working on. Many companies still ignore the importance of a good job advertisement. Not putting enough effort into it tells your applicants that you don't actually value them or their time. Keep in mind that you don't need to write a novel. A good job advertisement is typically short and simple. Focus on telling what the role is, what you offer for them and what skills applicants need to have to succeed. Don’t make a long list of demands. It is you who needs to sell the position and find a suitable applicant. Remember to be honest, you don't need to have a ping pong table in the office or warrior culture. People are different and they value different things. Some people want safety and transparency and others want to take a risk and join for example a startup. Try to avoid no-brainers. Don’t write that you have an amazing company culture or good benefits, rather tell about what makes your culture so special. Let your employees share their experience by expressing their opinions openly. As there are so many open positions out there, it is crucial to be creative. You need to have a story. Stories help people to get interested and make your offer as something unique. Every company has a story to tell which can help you to get noticed by the crowd. As mentioned before, you don't need to invent a story, just tell about the projects you are doing or technologies that you are trying out at the moment. Being authentic is a way to win people over. Candidates typically want to know more about the team and the people with whom he/she will work with. Unfortunately, we often forget to include that in our job advertisements. Telling about your company culture and the people is as important as telling about the role itself. We as humans tend to be curious of other people; who are they, what things are they proud of and how do they spend their free time. Recruitment marketing should always be aligned with company's employer brand. If you try to become something else the candidates will spot it easily and it can ultimately be quite damaging for your organization. Recruitment marketing is a good tool for building an interesting employer brand. Remember that every company has an employer brand. Some companies are in charge of it and some let it go with the flow. Recruitment marketing can help you to spread the message to people who have not yet been in touch with you. You have made an amazing job advertisement and your marketing campaigns are bringing right people into it. Nevertheless, you are still not getting enough candidates. We often forget about the apply process. If you require applicants to fill long forms, you can be sure of the fact that the brightest talents won't be applying. Ask only for the necessary information and discuss further when you contact the candidates. Not everything you do or try works out. Learning from mistakes is the one advice I can give. Best way to learn is measuring the funnel. Start from the impressions and the views you get, then dive into clicks you get and take a look how many people actually started the application process etc. If some number are not satisfactory it is time to make some changes. Edit one thing at a time and eventually you will get a better understanding of improvements and results. Remember that recruitment marketing is not a one time activity. It is something that we need to work with continuously and optimize base on results. According to a report from Almega there is a shortage of around 70 000 skilled IT personnel in Sweden in the coming years. The Swedish IT industry is booming and the demand for IT specialists is great which has led to fierce competition for the local talents. One solution is to look outside of your region and recruit internationally from countries with great access to the specific talents you are look for, whilst Sweden is an attractive country to live and work in.